Hiya guys, it’s Rose from Manicured and Marvelous taking over for today. I’m extremely happy to be able to help out Katherine while I’m on vacation at work. Best part about being on vacation is finally going through my pile of polishes I have to swatch. The beauty I have to share with you today was first on that huge pile by a long shot. Say hello to Garden Bouquet by L’Oreal! 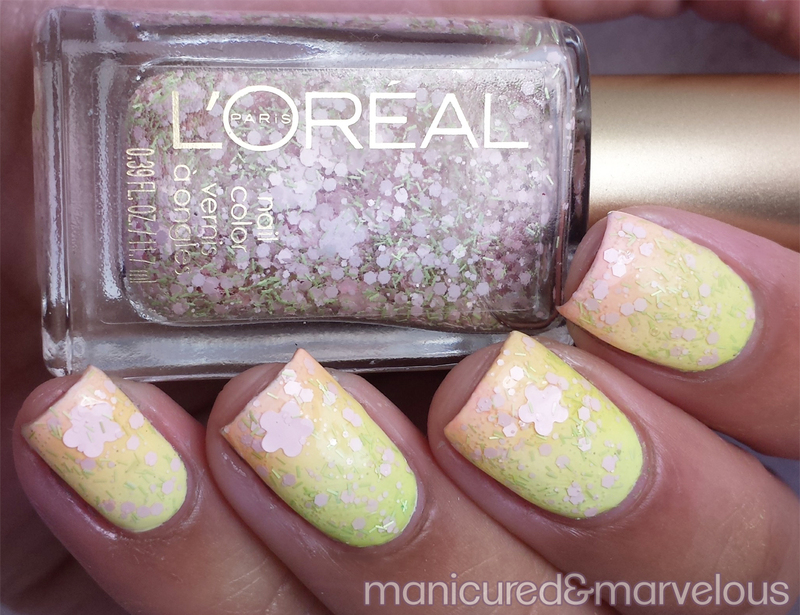 Garden Bouquet by L’Oreal is part of their Haute Floral Collection, which is their 2015 Spring release. The collection includes six creme polishes and this glitter topper for about $4.99 to $5.99 each at your local drugstore. Garden Bouquet is a clear topper filled with pastel pink hexes and green shredded glitters. The best part, of course, are the adorable pink flower glitters. The formula was surprising very easy to apply and had a amable amount of glitters per brush stroke. I will say the flowers do require a bit of fishing and placement, but that’s to be expected from a larger sized glitter. I had a hard time deciding what color base I wanted for this polish, so I decided on the only logical choice… a pastel gradient! I actually created a quick Instagram video (15 seconds) for you guys to see how I did my gradient. You can also watch the video here: https://www.youtube.com/watch?v=rDE-yjHzli4. The rest of the colors used in my gradient are all from last years Bleached Neon Collection from Maybelline. Now on to my favorite part of any glitter polish… the macros! I don’t know about you guys, but I am definitely in love with this glitter topper. Ever since the chaos that was Masked Affair back in January, I have been checking in on L’Oreal when I stop by Walgreens. I thought about grabbing the cremes in this collection, but wasn’t too drawn to the colors. Did you guys get a chance to see this collection? A huge thanks for Katherine for having me here and hope to catch all you guys soon! 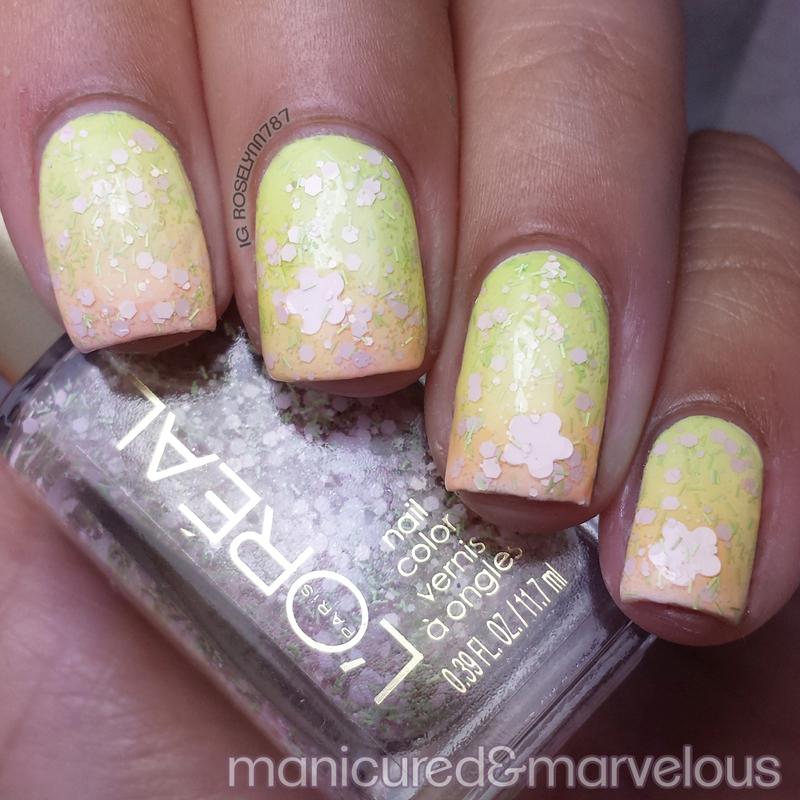 From Katherine: I'm in love with this glitter topper, such a perfect shade for spring. Thank you so much, Rose! If you haven't already be sure to check out Manicured and Marvelous on instagram, facebook, twitter and youtube! What a pretty glitter that is. I love that glitter. It's great to find the flowers in this instead of the usual circles and hexes. These are so cute! The colors are awesome! I absolutely love Hint of Lavender from this collection, and also have this glitter. Thinking about picking up Sweet Nectar as well! I like how you paired the glitter with a gradient! Thank you for having me, it was a lot of fun filling in and being able to help out! Great swatches! I like it over the pastel gradient. And I love that mainstream brands are taking cues from indies! Garden Bouquet is just lovely! So pretty! I knew I should have snapped this up when I saw it! Such a beautiful gradient. The glitter flowers are perfect on it. ok so let me start off by saying that I am not a fan of the hairy bar glitters or the bigger shaped glitters. But seeing this layered over that gorgeous gradient has got me questioning my judgement. The pairing goes together effortlessly. I love how you used the gradient to show off the topper, it's very delicate and pretty! This is SO pretty! It makes me so bright and sunny-feeling!